Topics: Cricket, Batting Gloves, Ball, Batting Legguards, and Wicket Keeping. 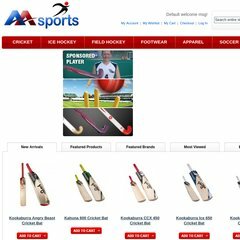 aasportsshop.com Adidas JD1 XTreme 24 Signature Composite Hockey Stick - Outdoor ..
Bluehost Inc (Utah, Provo) is the location of the Apache server. It has 2 DNS records, ns1.hostmonster.com, and ns2.hostmonster.com. Its local IP address is 66.147.240.159.